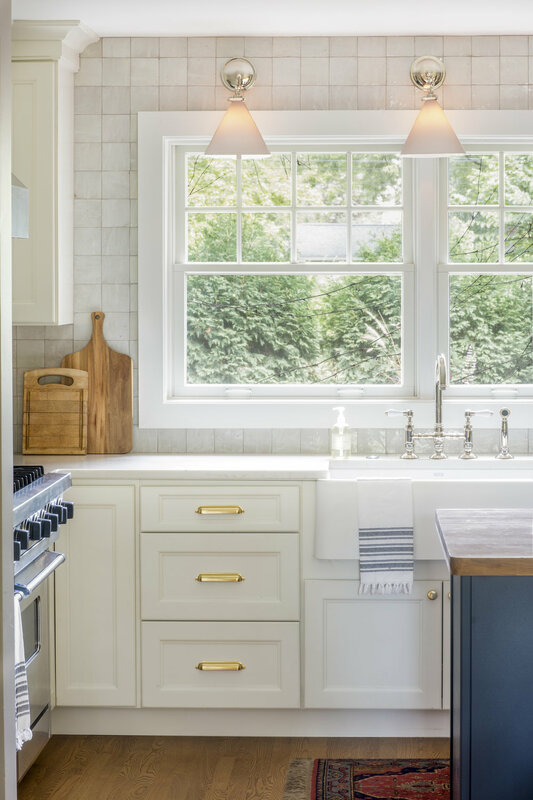 It’s been so long since we’ve blogged but this kitchen was just too good to not share some of the details that brought it all together. And some projects are just smooth and mostly easy and make you remember why you’re doing what you’re doing. 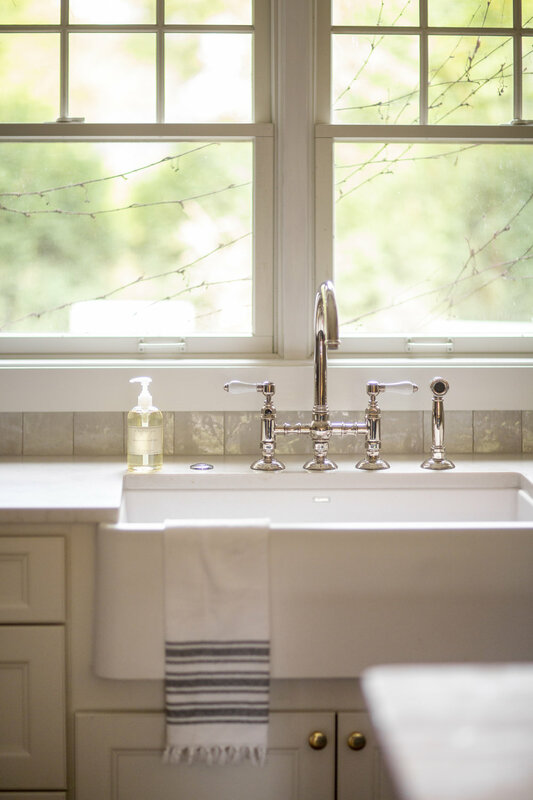 For us, it’s to create beautiful and inviting spaces that our clients are excited to come home to. From the first interaction with these clients we knew it would be one of those projects that was special and fun! We met with the clients last Spring and fell in deep like with them almost immediately. From our conversation it was apparent that their home was one of those coveted gathering places you went to growing up. And their kitchen showed it, too. It was well-loved, well-used and with memories all around. 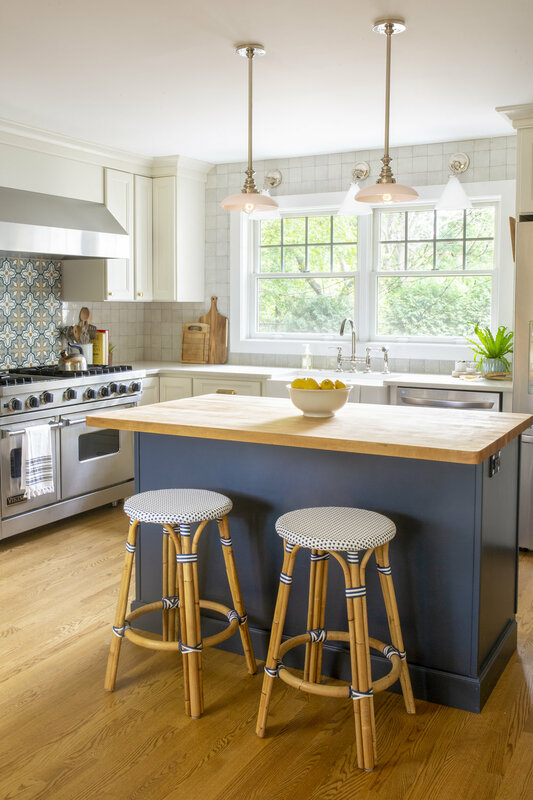 A few being the details the clients wanted to keep – the butcher block counter top, the sweet custom-made wood cabinets and a wall of family photos from a hundred years plus. Denisa and I truly went heart-eyes with the thought of using these things in the redesign. Don’t get me wrong, we both love shiny sparkly new things but if there’s a vintage store in a twenty-mile radius we will know it’s hours of operation and will be first in line when the doors open. The thought of using these pieces automatically elevated anything we would do in terms of design - wins all around! First on our list was to lighten the space. This was not an open-concept kitchen (honestly a little refreshing.) That said, the space was on the dark side. Here’s a peek at their previous cabinetry. We both loved the color but felt an off-white would brighten the space all around. For palette we looked around us. Their home which was mostly warm tones (reds, yellows, greens, and some blues) needed something complimentary. 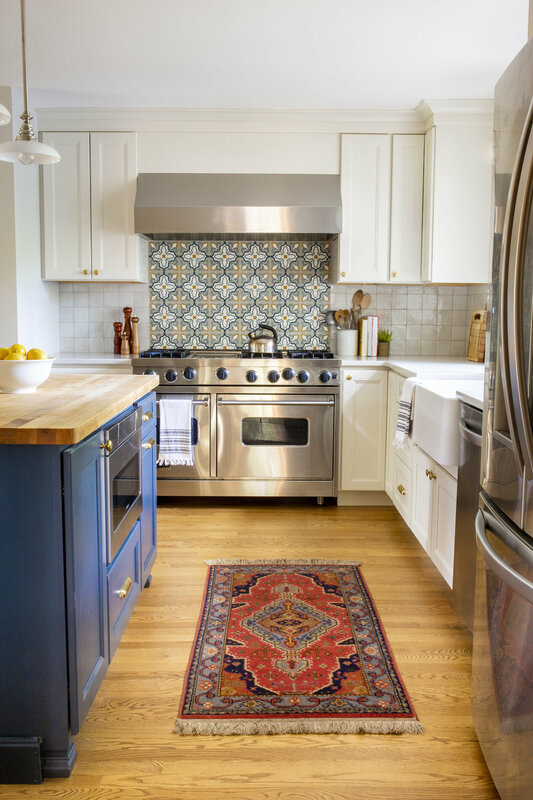 We chose blue for the island and brought in more warm tones with the yellow in the cement tile behind the range. When we left our initial meeting, we both agreed that the space had this English cottage thing going on. With that in mind, we envisioned a farm sink with a bridge faucet. We love to play around with mixing metals when it makes sense. In this case, the effect of the polished nickel accents and brass hardware felt carefully curated rather than overly designed. 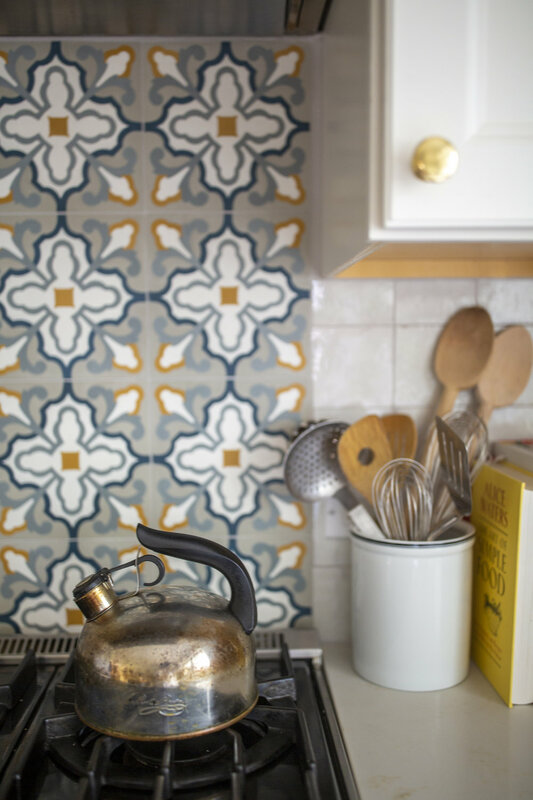 Circling back to the backsplash – not only did we choose to bring in color here with the cement tile but also our favorite Zellige from Clé Tile for some added texture. It’s classic and interesting and picks up light in all the right ways. PSA: Don’t be afraid of the variation of each tile - that’s where the beauty comes in. Truly. Keeping with the English cottage theme, we chose a more rustic farm table from RH and chairs from Arhaus. You guys - they are so comfortable and there is actually a spring in the seat. Just think of how long you could sit there and play Settlers of Catan and drink wine. Just kidding - hour long strategy games should all be put in a pile and burned. Just kidding! (not really!) I digress. Moving on to the built in cabinet on the side wall. A big request from our clients was the lack of thoughtful storage. That said, we needed this closet space but we also needed it to be more useful and more attractive. 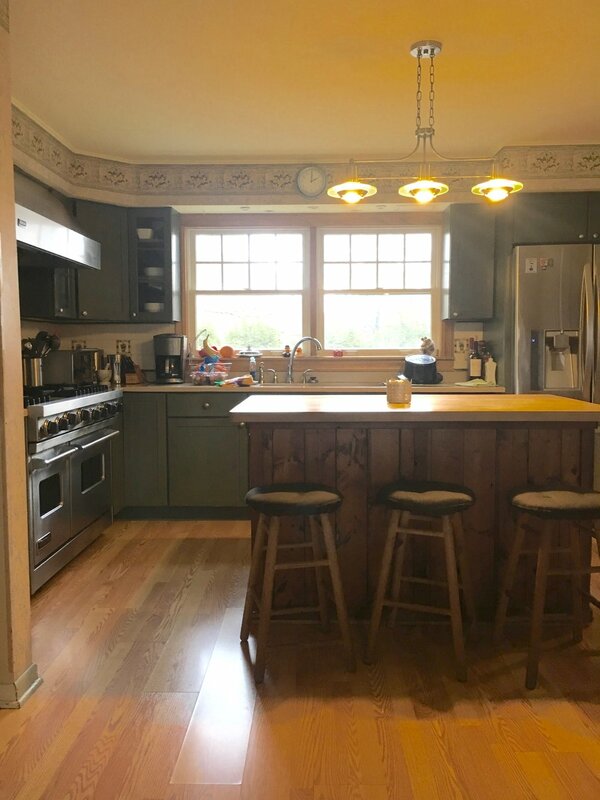 We wanted it to stay flush to the wall to keep with the flow of the room and also not compete with the other custom cabinets. If you can dream it, someone can build it! We had this pretty thing built flush to the wall to match the new cabinetry with pretty legs to boot. The outcome, we think, is old meets new in the best possible way. We were able to maintain the charm of the space from the elements we were able to re-use but the updates create a light and inviting space that we hope will be loved for many, many more years to come! We're starting to wrap up so many projects nearing the year's end and it was so fun to put the finishing touches on this sweet little nursery this past weekend. What started as a blank (gray) slate was quickly transformed when we pitched the to-die-for wallpaper from Genevieve Gorder. Our client knew she wanted a statement wall, so a statement wall she got. 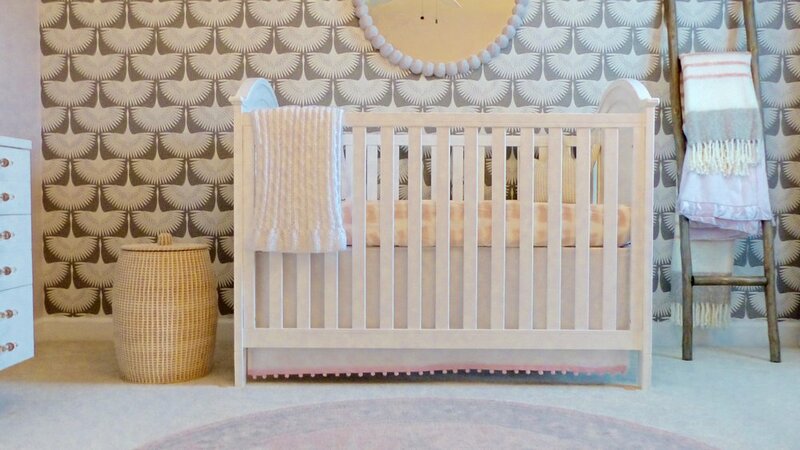 We paired it with pinks for a sweet baby girl and our client actually found the perfect pink for the space – Proposal by Benjamin Moore to be exact. The dresser was a refinished piece that we found at a local resale shop. We had it sprayed White Dove by Benjamin Moore and added this killer hardware from Anthropologie. It was a labor of love just to coordinate the transformation of that piece but to have a solid piece of furniture for about $500 beats anything you could get in a store this day and age. We were all beyond pleased with the uniqueness of this piece when all said and done. The XO's were an Etsy find and per our recommendation, our client had them printed and framed through Framebridge – couldn't have been easier. Many of the other pieces were Pottery Barn including the bedding, drapes (blackout), mirror and rug while the toy box/bookcases were our favorite kids storage solution from Land of Nod. Another favorite is the decorative ladder – a perfect solution for blanket storage which also adds some much needed height and texture to the space.